Democratic presidential candidate Hillary Clinton has proposed a change in the top capital gains tax rates. 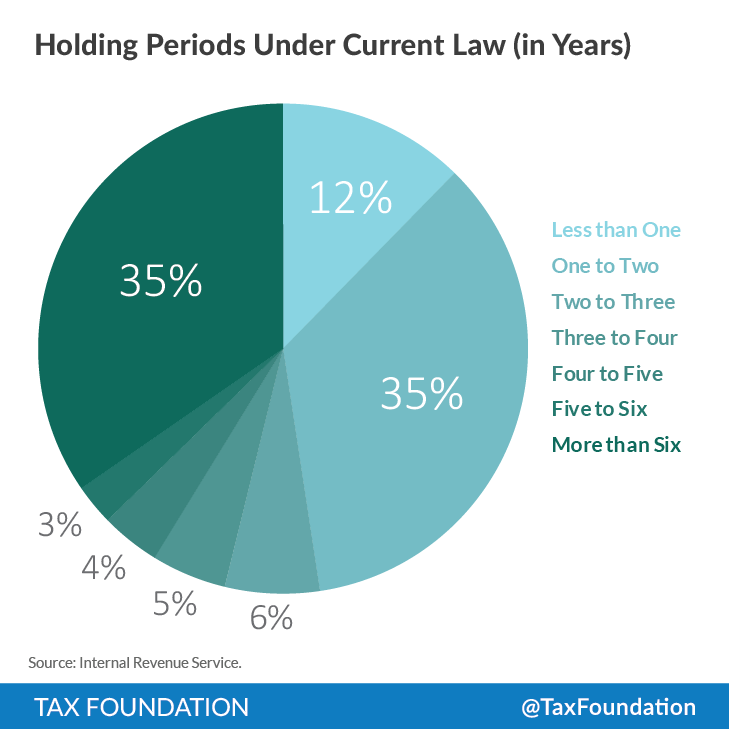 Under current law, such capital gains have a two-tiered structure: short-term gains face a top rate of 43.4 percent (including the 39.6 percent statutory rate plus the 3.8 percent investment income surtax) and long-term gains, defined as those with a holding period of more than a year, face a reduced tax rate of 23.8 percent (20 percent statutory rate plus the 3.8 percent surtax). Secretary Clinton’s proposal would stick to the general principles of the current system, but elongate the decline. Gains with a holding period of one to two years would also be subject to the 39.6 percent statutory rate. Gains of two to three years would be subject to a 36 percent statutory rate, and thereafter the statutory rate would decline by four percentage points per year until reaching the current long-term rate of 20 percent at six years. It is notable that the long-term rate remains the same as current law. 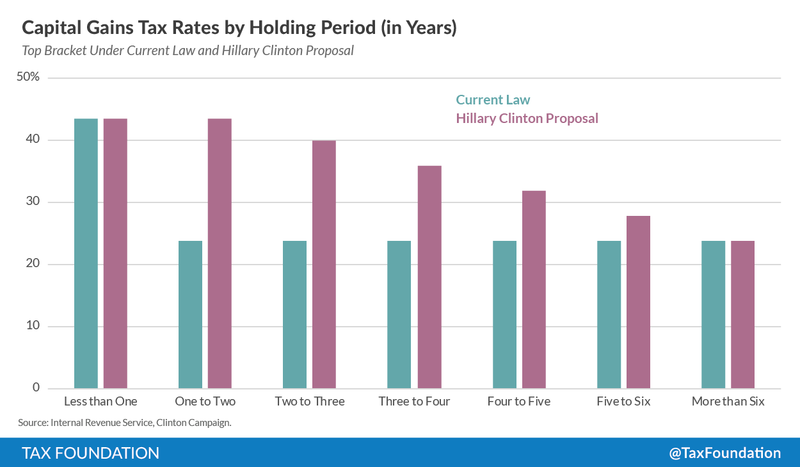 In neither this campaign nor her previous campaign has Clinton expressed interest in raising the long term rate on capital gains. In a Democratic presidential primary debate in 2008, she was asked if she planned to raise the top capital gains rate, and she replied “I wouldn't raise it above the 20 percent if I raised it at all. I would not raise it above what it was during the Clinton administration.” That statement was made in an environment where the top rate was 15 percent under President George W. Bush’s tax cuts. Since then, the top rate has climbed to 23.8 percent under President Barack Obama. And furthermore, the President has proposed raising the rate to 28 percent. Secretary Clinton takes a different tack on the issue. It seems like she sees value in keeping a low long-term capital gains rate in order to encourage investment. 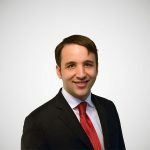 In fact, the connection between business investment and capital gains tax rates is abundantly clear in Secretary Clinton’s stated reasoning for a sliding scale in the medium term. The stated reasoning behind Secretary Clinton’s capital gains tax plan, outlined at a speech at NYU’s Stern School of Business, is to reduce incentives for what she calls “quarterly capitalism.” The idea, roughly speaking, is that businesses are too concerned with showing immediate success on their earnings reports in order to please investors, and therefore that they are unwilling to take on projects in which successes are less immediate. In other words, businesses might be underinvesting. By designing a tax code to encourage longer holding periods, the thinking goes, the government can get shareholders to more willingly accept long-term business ventures. It is probably best to start with the soundest part of the reasoning above. The idea that the sliding scale will encourage longer holding periods for capital gains is true. One of the main reasons we know it to be true is that it’s true under the current tax code. Right now, our two-tiered system for capital gains shows a remarkable bias toward holding periods of just over one year. The exact percentages can vary from year to year, but the important illustrative feature of the chart is a curiously strong preference for the one-to-two-year holding period. 35 percent of all realized gains in 2007 came from that one-to-two-year holding period. If you refer back to the design of our current two-tiered system, the reasoning is obvious: taxpayers often prefer to hold onto their gains until they qualify for the lower long-term rate. They change their behaviors in response to the tax code – something that economists call elasticity. The Congressional Budget Office has often attempted to measure this particular elasticity – the change in capital gains realizations with respect to taxes – using econometrics, and concluded that it’s quite high. The effects are powerful. Realizations would be heavily weighted towards the six-year mark; and if anything, the elasticity estimate from the CBO is conservative. The tax plan, in effect, increases your gains by 4 percent for every year until you’ve held it six years. It’s natural to respond in this way. This results in an interesting paradox; the ostensible tax increase doesn’t actually raise revenue year-over-year, because the higher rates for some gains would be offset through reduced realizations. Under our calculations, revenue would decline very slightly overall, by about $18 billion a year. (For reference, this paradox also showed up after the “fiscal cliff” deal.) The key to understanding this paradox is that outstanding stock of unrealized gains increases, delaying revenue continuously into the future. However, the ultimate purpose of this tax change was not to raise substantial revenue (which it will not) nor to increase holding periods (which it will, but this isn’t per se a good thing.) The purpose of the tax change is to improve corporate behavior, and it should be evaluated on those grounds. At Tax Policy Center, Len Burman is skeptical that the policy will have any changes on corporate governance, writing that the proposal “suffers several defects.” The blog post is full of good points, and the whole thing is worth a read, but I will highlight some of the most important substantive remarks here. But pulling cash out of the company – and paying tax on dividends or capital gains – only makes sense if the company’s marginal investments are underperforming by a substantial margin. The cash drain might hurt workers inside the firm, but the redeployed cash will create jobs elsewhere. Overall, the economy gains because the extracted cash is invested in more productive activities. The bigger problem appears to be passive investors who stand idly by while corporate CEOs pack their boards with cronies who rubber stamp outsized executive compensation and mediocre performance. 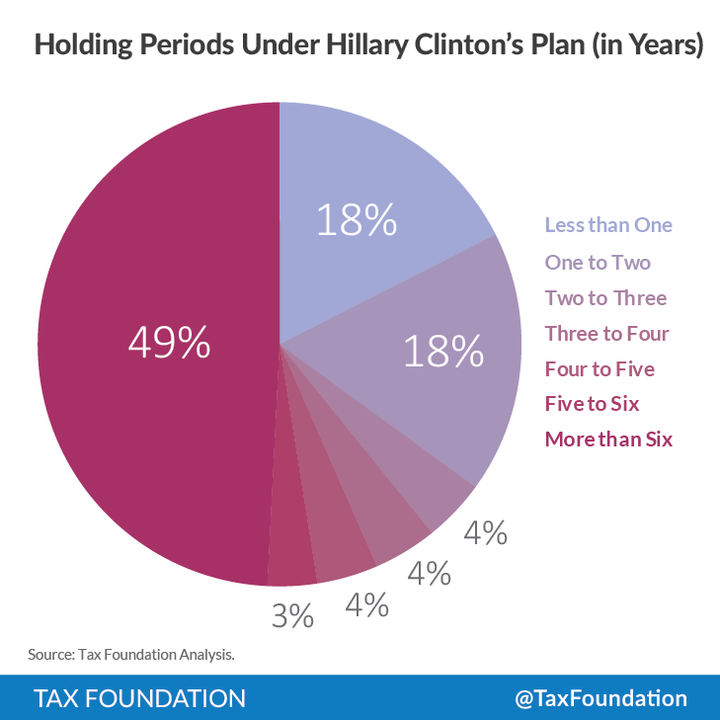 There would be no incentive to wait until the one-year anniversary under the Clinton proposal, so the share of assets held for less than a year would increase. Moreover, in the U.S., at least 60 percent of corporate stock is held by entities not subject to capital gains taxation: institutional investors such as insurance companies and pension funds (both public and private), corporations, nonprofits, and foreign investors. Most individuals who own stock do it through a 401(k) or IRA, neither of which is subject to the capital gains tax. And, of course, the proposal by design only affects taxpayers in the top tax bracket (although they do account for an outsized share of taxable capital gains). In addition to the points made in TPC’s analysis, I have a few stray thoughts. The first is that investors seem very happy to think on long time horizons. Companies like Amazon, Under Armour, and Google have famously traded at huge multiples of their current earnings, because investors wisely expected them to reinvest their capital into new productive ventures. There is a legitimate question of whether short-term thinking is a problem among investors at all. There is also some reason to believe that shorter holding periods are actually better for high-quality capital investment. Tax structures that discourage realizations are prone to a "lock-in" effect, where investors cannot reallocate to more productive investments or rebalance their portfolios to mitigate risk, because of the tax implications. The Wall Street Journal was critical of the proposal on these grounds. Finally, as Burman notes, passive investors often have little direct influence over corporate decision-making, an effective tax policy to encourage more corporate investment would probably be directly concerned with capital outlays at the corporate level. To that end, expensing – allowing the immediate deduction of costs of investment from corporate income – would be a much more effective policy.